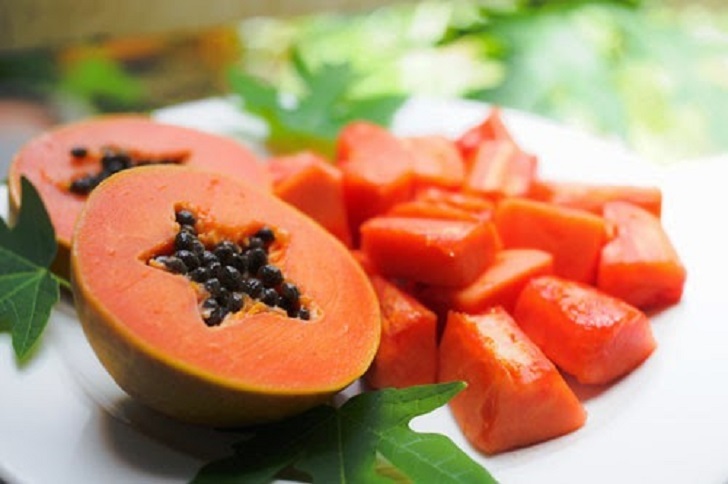 Ripe papayas are rich in vitamins and also aid digestion. Eating them is especially helpful for weak or old people who complain of an upset stomach when they eat meat, chicken, or eggs. Papaya makes these foods easier to digest. Papaya can also help get rid of intestinal worms, although modern medicines work better. Collect 3 or 4 teaspoons (15-20 ml.) of the ‘milk’ that comes out when the green fruit or trunk of the tree is cut. Mix this with an equal amount of sugar or honey and stir it into a cup of hot water. If possible, drink along with a laxative. Even better, dry and crush to a powder the papaya seeds. Take 3 teaspoons mixed with 1 glass water or some honey 3 times a day for 7 days. Papayas can also be used for treating pressure sores. The fruit contains chemicals that help soften and make dead flesh easier to remove. First clean and wash out a pressure sore that has dead flesh in it. Then soak a sterile cloth or gauze with ‘milk’ from the trunk or green fruit of a papaya plant and pack this into the sore, Repeat cleaning and repacking 3 times a day.